My first sewing project is officially done! I saw this quilt at Anthropologie months ago (maybe even a couple years ago) and loved it. The price, however, I did not love. 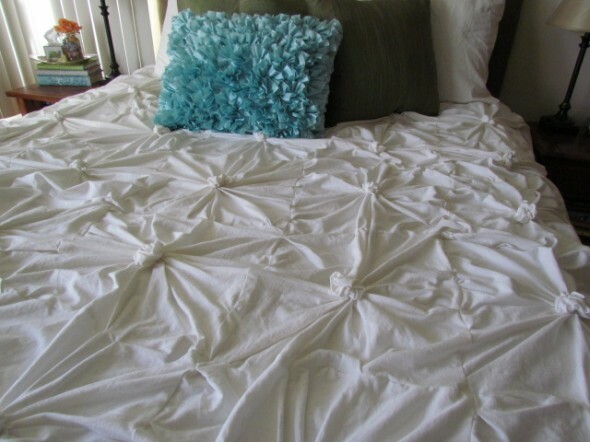 Bedding can be so ridiculously over-priced, especially duvets. 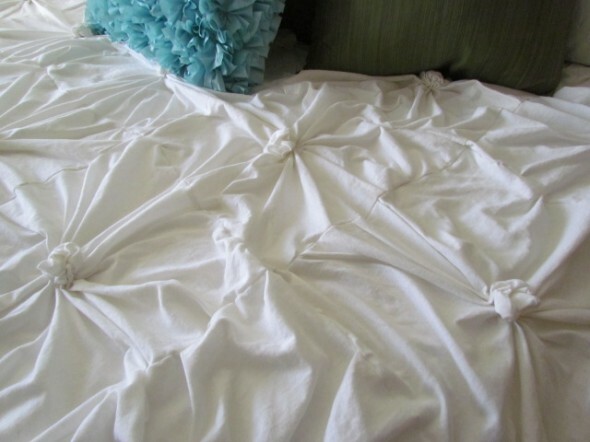 When you think about it, a duvet is pretty much 2 sheets sewn together- you still have to BUY the comforter to go inside the duvet. Also, I’m very picky when it comes to bedding and it seems difficult for me to find “gender neutral” comforters/quilts/duvets (some might argue this is girly, but I don’t care because this has been a long time comin’ and it took me a looooooong time to make so it’s going on the bed). Back to the point of my story… I saw this quilt at Anthropologie and fell in love with it. Fast forward months and months later, I find this post and this post. Looks like someone else thinks just like me :) I thought it looked simple enough to make, regardless of the fact that I didn’t know how to sew and I didn’t own a sewing machine. Minor obstacles, right? Well, enter my birthday, my parents got me a ridiculously AWESOME sewing machine (and Matt got me a ring to seal the deal- best birthday EVER)! 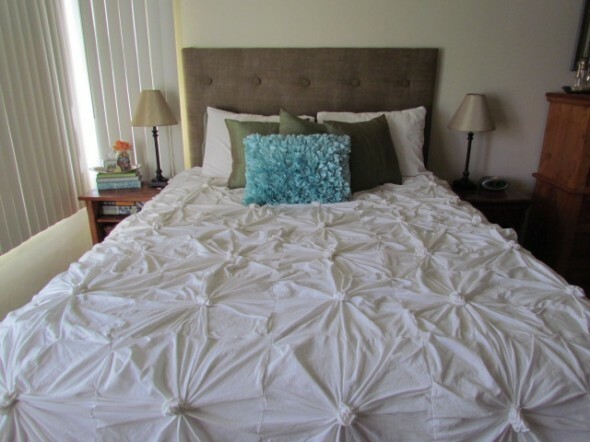 Once I got my machine I figured “go big or go home” with my first sewing project… might as well sew this duvet. And “sew this duvet” I did, and sewed, and pleated and pinned and sewed, and pleated and pinned and sewed, pleated some more… you get the idea. If you want to make one, the directions in the posts above are really great. Very detailed and easy-to-follow. If a novice like me can make this ANYone can make this! This turned out so well! Everything looks beautiful. And the headboard? Excuse me? Love. It. Can’t wait for the post. Tufting and everything…geez.